The Island Peak Climbing is certainly one of the best peak climbing experiences you will ever have. 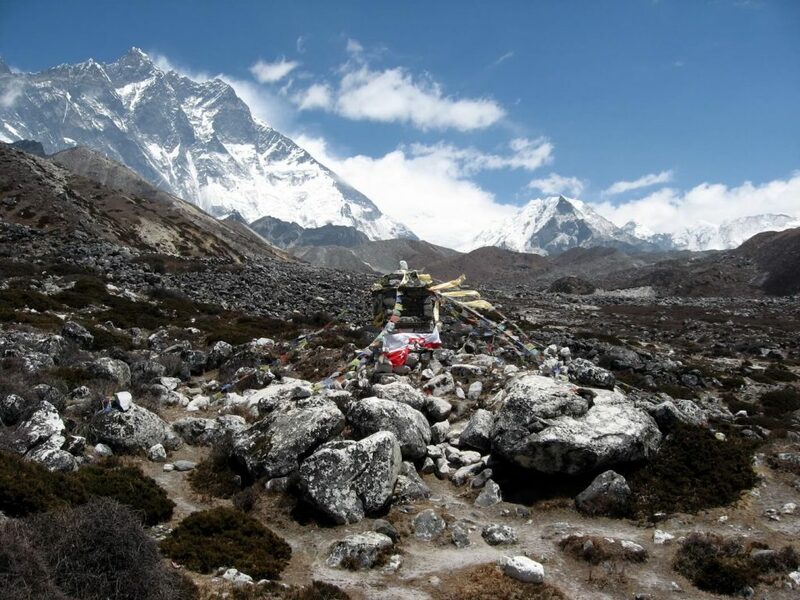 This trip will also include Everest Base Camp Trek making this trip an experience of a lifetime for you. The Island peak is suitable for fit trekkers who have a bit of mountaineering experience. Don’t worry, if you have zero mountaineering experience, you can still climb the Island peak provided you are physically fit. Also, this climb is not very technical. This trip takes place in the Everest region of Nepal. This trip will take us to the Khumbu region of Everest and you will also have a closer look at the Sherpa Culture. Before we climb the Island Peak, we will complete the Everest Base Camp and Kalapatthar. The Island Peak Climbing will let you experience the sensational view of the mountains peaks such as Everest, Lhotse and Makalu among others. We will take this trip one step at a time and help our body acclimatize at regular intervals. Our Sherpa guides will be there at all times. 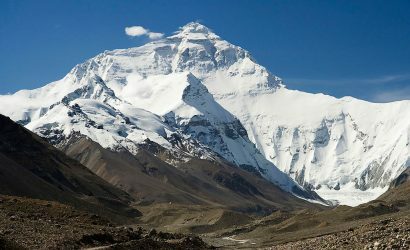 The perfect time to do the Island Peak Climbing would be during spring and autumn. 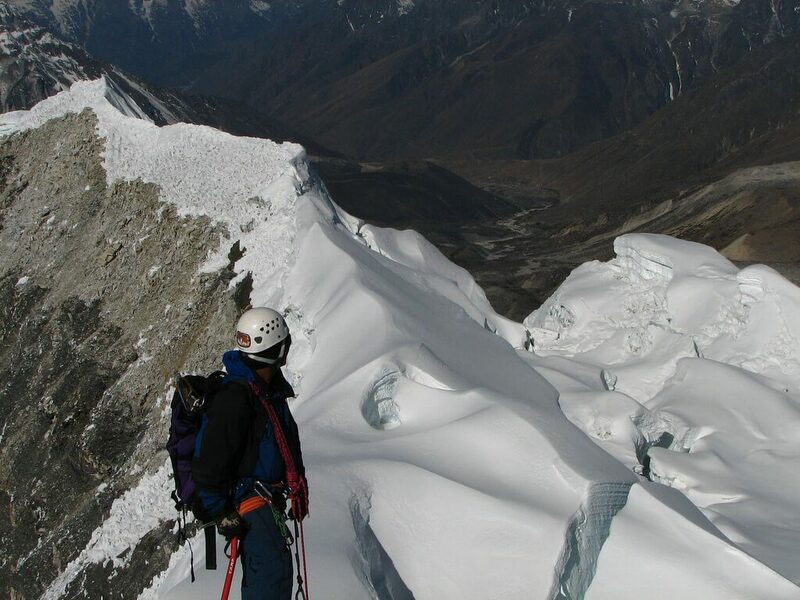 Many mountaineering enthusiasts come to Nepal to start their mountaineering experience. Accommodation: 3- star hotel in Kathmandu Meals: Dinner Our representatives will pick you from the airport and you will be taken to the designated hotel. You can rest for the day and during the evening we will have dinner where you will be served Nepali dishes. Accommodation: 3- star hotel in Kathmandu Meals: Breakfast On this day we will prepare for the climb. Your guides will check your climbing equipment and give you necessary suggestions. If you have not brought some of the equipment, you can make your purchase. This time should also be used to bond with your guides and fellow climbers. Accommodation: Basic Teahouse Meals: Breakfast, Lunch and Dinner. Duration: 3-4 hours walk & 45-minutes flight On this day we will head to Lukla. The flight is about 45 minutes. During the flight, we will be able to see the spectacular view of the mountain ranges right after we take off. The scenic flight ends with a landing at an airport that has been dubbed as one of the most dangerous airports in the world. This unique airport is on the top of a flat hill and has a limited runway. Get ready to be enthralled. After we get down at Lukla, we will eat our lunch and rest for a while before we officially start our journey on foot. We will walk a total of 3-4 hours before we reach Phakding. The path is flat and occasionally downhill. It is well maintained in stone steps. We will rest for the night in Phakding which is situated at an altitude of 2610 meters. Accommodation: Basic Teahouse Meals: Breakfast, Lunch and Dinner. Duration: 5-6 hours walk On the fourth day of the trek, we will be heading to the famous Namche Bazaar which is famously known as the gateway to Everest. We will walk through rocky paths and will come across occasional declines and several inclines. The trail is quite rocky at times. We will get an amazing view of Namche Bazaar before we get there. We will also be accompanied by the spectacular view of the mountain ranges. We will also cross suspension bridges before we reach Namche Bazaar. The Dudh Koshi river and some parts of the trail are laden with rhododendron and magnolia forests. The famous old town of Namche is the busiest town in this region. The colorful houses, restaurants and souvenir shops make this place quite an attraction. This Sherpa town is situated at an altitude of 3440 meters. We will spend the night in Namche in a basic teahouse. Accommodation: Basic Teahouse Meals: Breakfast, Lunch and Dinner. Duration: 5-6 hours walk if hike to Khumjung It is necessary that you rest for a day in Namche Bazaar. Your body needs to rest and adapt to the changing environment. During this rest day, you can explore the vibrant town of Namche Bazaar. Experience the rich culture and history of the Sherpa People. You can also opt to hike to Khumjung village and visit the Edmund Hillary School and Khumjung monastery. Accommodation: Basic Teahouse Meals: Breakfast, Lunch and Dinner. Duration: 5-6 hours walk We head out to Tengboche on the 6th day. From Namche Bazaar to Phunki, the trail is quite simple. After that, our ascend starts and after about 5-6 hours of walking, we will reach Tengboche. Tengboche Monastery is one of the most famous monasteries in the region. It is also the largest monastery in the region. It falls under the Sagarmatha National Park is one of the many UNESCO Heritage sites in Nepal. From the monastery, you will have a spectacular view of the mountains such as Everest, Nuptse, Lhotse, Ama Dablam and Thamserku. There is an off chance that we might also experience the evening prayers. Accommodation: Basic Teahouse Meals: Breakfast, Lunch and Dinner. Duration: 4-5 hours walk We start our day by visiting the Tengboche Monastery. We can take pictures as the view from this place is unbeatable. Then we start our journey towards Pheriche. Our journey starts after we take the trail that leads us downwards towards a forest and then we cross a river. We then ascend gradually and we will see the vegetation of the land thinning away as we reach the 4000 meters mark. Before reaching Pheriche we will rest for a while in Pangboche. After about 4-5 hours of walking, we will reach Pheriche and we rest for the night here. Accommodation: Basic Teahouse Meals: Breakfast, Lunch and Dinner. Duration: 5-6 hours walk We head out in the morning and reach Dugla where we rest for a while. 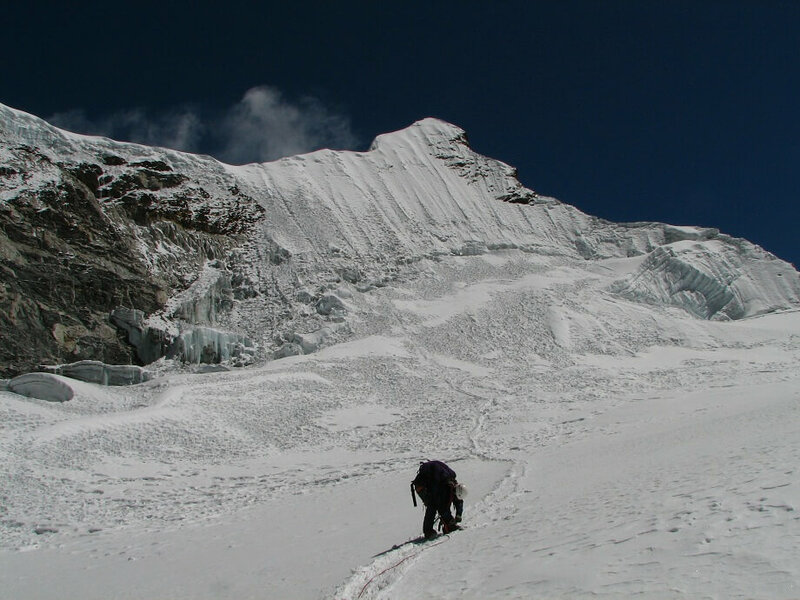 Here, the trek gets a little bit tricky as we climb and get past the moraine of Khumbu Glacier. We then make a steep climb and reach Chupki Lhara. After ascending further, we reach Lobuche. On our way to Lobuche, we will have the chance to spot some of the mountains such as Khumbutse, Lingtren, Pumori and Mahalangur. We spend the night in Lobuche. Accommodation: Basic Teahouse Meals: Breakfast, Lunch and Dinner. Duration: 6-7 hours walk On the ninth day, we will head towards the Everest Base Camp. we have to go through Gorak Shep where we will rest before we carry on with our journey. The trail gets quite challenging and the increase in altitude also increase the difficulty level. It is advised that you follow our Sherpa climb leader carefully. The path to the base camp will take us through rocky dunes and moraine until we finally get there. 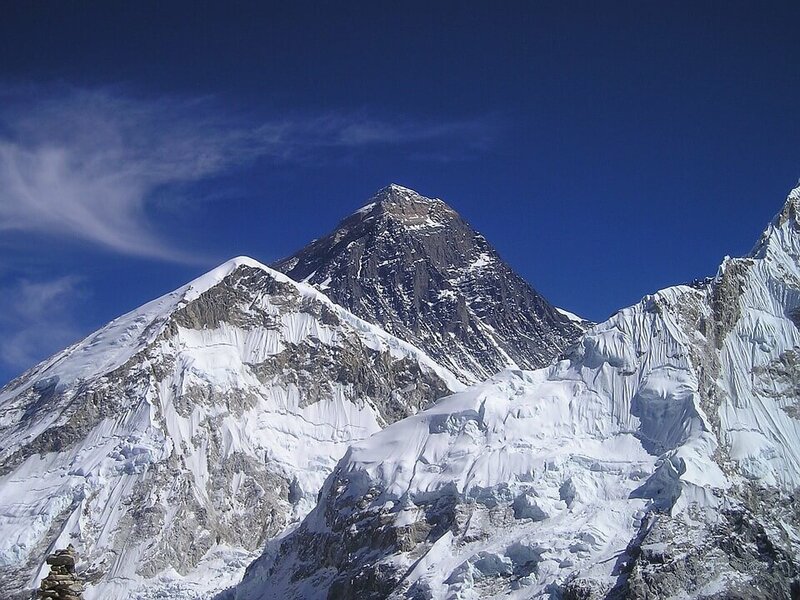 The Everest Base Camp is situated at a mammoth altitude of 5364 meters. Here we will also see the tents of mountaineers preparing to conquer Everest. 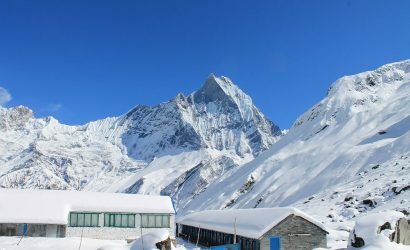 From the Base Camp, you can see mountains such as Nuptse, Khumbuste and Pumori. Accommodation: Basic Teahouse Meals: Breakfast, Lunch and Dinner. Duration: 7-8 hours walk On this day we will be trekking to Kala Patthar. We will leave before dawn and take a steep trail to Kala Patthar. It is going be very cold and dark during this time period. Kala Patthar, over the years, has gained popularity for being the spot for amazing Everest pictures. The clear skies and majestic view of the mountains such as Everest, Lingtren, Khumbutse, and Changtse. The 360-degree view from the top of Kala Patthar is unbeatable. After spending some time in Kala Patthar, we head down to Lobuche where we rest for the night. Accommodation: Basic Teahouse Meals: Breakfast, Lunch and Dinner. Duration: 6-7 hours walk On this day we will head to Chhukung. In order to get to Chhukung, we will have to cross the Kongma La Pass which is quite challenging. The ascent to Kongma La is demanding but an adventurous one nonetheless. When you reach Kongma La Pass, this pass has been marked by prayer flags. After completing our customary photoshoots, we will head to Chukkung. Our descent will first take us to Imja Khola valley and then we will reach Chukkung. It is a small village that is situated at an altitude of 4730 meters. After reaching Chukkung, it is necessary that we do our equipment-check for Island Peak Climbing. We will spend the night in Chukkung. 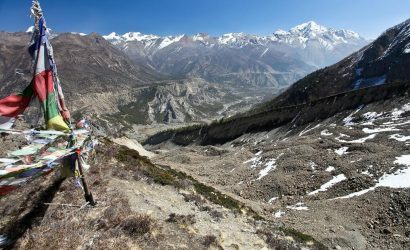 Also, there is an alternative route to Chukkung via Dingboche. Accommodation: Basic Teahouse Meals: Breakfast, Lunch and Dinner. Duration: 3-4 hours walk On this day we will head to Island Peak Base Camp. The trail to the base camp is quite steep making it a difficult one. We will head south first and continue our ascent and then turn east. We will then take a winding path and continue walking until we reach Island Base Camp. On this day, we will trek for about 3-4 hours. We spend the night at Island Peak Base Camp. Accommodation: Basic Teahouse Meals: Breakfast, Lunch and Dinner. On this day, we will have our pre-climbing training. 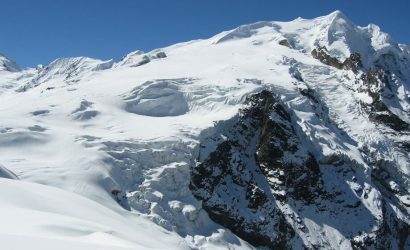 Our guides will help you acquire climbing techniques and the best way to use climbing gears such as ice axe, climbing boots and crampons, harness, ascender, etc. You will also learn how to use the rope for your climb. We believe that learning these climbing techniques will help you get confident in Island Peak Climbing. For the rest of the day, we can go around the base camp and rest for tomorrow’s epic climb. We will spend the night in the base camp. Accommodation: Basic Teahouse Meals: Breakfast, Lunch and Dinner. Duration: 10-12 On this day, we need to start our journey around 2 am. As the summit gets really windy in the afternoon and it will be really difficult to climb. On this day, we will cross the 6000 meters mark. The trail takes us first from the base camp for few hundred meters and we need to climb a steep hillside. The path is laden with boulders and as we gradually climb up the hill the path narrows and enters a steep rocky channel. We will then follow a ridgeline which will lead us to the summit glacier. Ropes will be used in order to facilitate your climb. We will use both fixed rope and man rope. 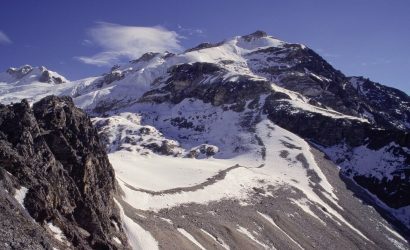 We will use ladders in order to cross the crevasses which usually will be 3-4 meters long. We will finally reach the summit of Island Peak. Experience the sensational view of the mountains from a staggering altitude of 6189 meters. We then head back to the base camp where we celebrate our successful Island Peak Climbing. Accommodation: Basic Teahouse Meals: Breakfast, Lunch and Dinner. Duration: 5-6 hours walk On this day, we will start our return journey. This trek will be much easier because we will start our descent. We take the route back from Khumbu valley and come to several villages. You can also opt to go to the famous Gompa is Upper Pangboche and then head to Pangboche. 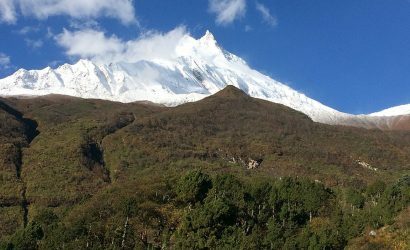 From Pangboche, you can enjoy the sensational view of the mountain peaks such as Everest, Ama Dablam, Thamserku, and Kangtaiga. Accommodation: Basic Teahouse Meals: Breakfast, Lunch and Dinner. Duration: 4-5 hours walk On this day we will head to Namche Bazaar. We will take the route which follows the river Imja and then take the forest trail which will lead us to Tengboche. We can visit the famous Tengboche Monastery. After Tengboche, we will take walk through trails laden with rhododendron trees. We will then take the trail which follows the Dudh Koshi river until we reach Sansa. We will then walk until we finally reach Namche Bazaar. Accommodation: Basic Teahouse Meals: Breakfast, Lunch and Dinner. Duration: 5-6 hours walk We will start our descent further as we take the trail to Lukla which is quite rocky. We will cross several suspension bridges and then finally reach Lukla. Today will be the last day of walking. We rest in Lukla. Accommodation: 3- star hotel in Kathmandu Meals: Breakfast, Lunch and Dinner. Duration: 5-6 hours walk We take a flight early in the morning to Kathmandu. On reaching Kathmandu, you can do your shopping as it will be your last day in Nepal. In the evening we will have a farewell dinner and celebration for your successful Island Peak Climbing. Our representatives will drop you at the airport. Share your wonderful experience in Nepal with your family and friends. Also, if you intend on extending your stay in Nepal, please let us know. We would be honored to be at your service as we offer several tour and trekking packages. Please be advised that Island Peak Climbing is not a regular trek. We will be climbing a peak and it is more challenging. Since it has few elements of risk, we will take the necessary steps to give you proper safety. This may involve altering the itinerary if the situation demands us to. There might be few cases such as bad weather conditions, deteriorating health of a team member, natural disasters, etc. Basic teahouses accommodation during the entire trek. Dinner during your welcoming as well as farewell. Mountaineering equipment for the trek.